Nassau Suffolk Water Commissioners Association (NSWCA) elects new board for 2013 term. At a recent Nassau Suffolk Water Commissioners Association (NSWCA) meeting, sponsored by Cathedral Gardens Water District in West Hempstead, the Association, which consists of 21 Long Island water districts, recently elected a new board for the 2013 term. The term of service for NSWCA’s new board members runs January 1, 2013 through December 31, 2013. 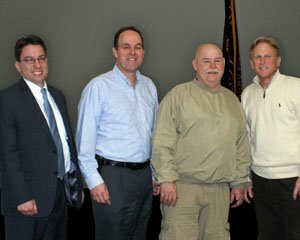 The newly elected 2013 Board includes: President Gary Brosnan of South Farmingdale Water District; 1st Vice President Howard Abbondondelo of Albertson Water District; 2nd Vice President Donald MacKenzie of Oyster Bay Water District; Treasurer John Sullivan of Bethpage Water District, a past President; and Secretary Thomas P. Hand of Massapequa Water District. Organized and chartered in 1981, the Nassau Suffolk Water Commissioners Association (NSWCA) is comprised of Water Commissioners from 21 Nassau County and Suffolk County Water Districts. NSWCA is dedicated to communication, efficiency and best practices among Long Island’s water districts. As part of its mission, the association holds monthly educational meetings sponsoring experts on topics that include law, cost efficiencies, rules and regulations and other issues germane to water utilities. For further information, please contact the Nassau Suffolk Water Commissioners Association President Gary Brosnan via phone at (516) 903-7418 or email, gary@sfwater.com. Agency Contact or for information regarding your district’s Water Commissioners, please contact Jamie Stanco, Progressive Marketing Group, Inc. via phone at 631-756-7160 or email jpstanco@pmgstrategic.com. Subject: LongIsland.com - Your Name sent you Article details of "Nassau Suffolk Water Commissioners Association (NSWCA) Elects New Board"